Following on from their hugely successful collaboration on Alice’s Adventures in Wonderland, choreographer Christopher Wheeldon, composer Joby Talbot and designer Bob Crowley have joined forces once again to create a new three act ballet based on Shakespeare’s play. Keen to tell the entire story without resorting to a series of tableaux, Wheeldon has created principal dance roles for six of the leading characters to enable him to express the complex range of emotions involved in the plot. Edward Watson has the daunting task of showing Leontes to be consumed by jealousy, and he achieves this during act 1 using movements that become more contorted and angular as the story unfolds. As Lauren Cuthbertson’s Hermione slowly grows more heavily and visibly pregnant and Polixenes (Federico Bonelli) makes himself at home, Watson’s rage and rejection is clearer than any words could depict. Zenaida Yanowski as Paulina, along with Bonelli, occupy large swathes of the 1st and 3rd acts beside Watson. One of the most remarkable parts of the work for me was the huge duet for Sarah Lamb and Steven McRae that occupies most of the act 2nd act. Their Perdita and Florizel are absolutely captivating. Alongside them, we also find Gary Avis in a great character role as the Father Shepherd. Special mention must go to Joe Parker who gave a great performance as the young Mamillius. 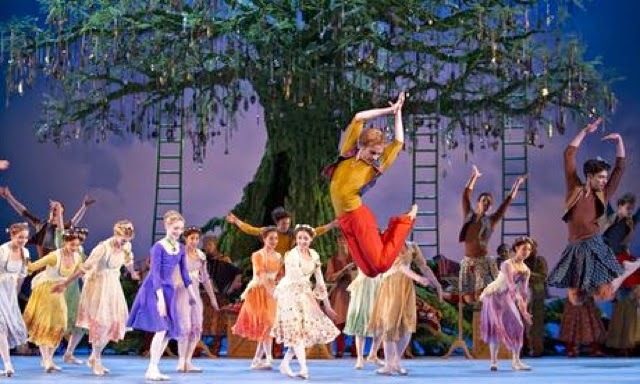 Both Joby Talbot’s eclectic score and Christopher Wheeldon’s inventive choreography manage to encompass both traditional classical styles and a more contemporary approach in a seamless way that gives the piece a sense of occupying a central place in the repertoire, and the work seems set for frequent revival on this basis alone. The orchestra is large and heavy on colour, with a big complement of percussion, and it was possible to hear nods toward Prokofiev and Stravinsky as well as a good deal of Glass and even, in the bohemian scenes, Smetana and possibly Kodaly. During parts of the 2nd act, with the onstage band, it was also impossible not to be reminded at times of Riverdance. The orchestra, who were arranged in an odd layout in the pit, were conducted by David Briskin. Designer Bob Crowley has worked with Daniel Brodie and Basil Twist who have created projections and silk effects that complement his solid architectural and sculptural sets, which float elegantly about the stage. Almost all the scene transformations are in view and the projections onto massive billowing silks create some magical effects, including the appearance of two sailing ships and a tremendously imaginative realisation of Shakespeare’s famous stage direction that Antigonus should exit pursued by a bear. If I saw that creature looming behind me I’d be making a swift exit myself. Shortly before this exit, Bennett Gartside’s Antigonus leaves an ever so slightly creepy looking animatronic baby Perdita behind him in a basket hidden in the reeds. This new work has a scale and sweep to satisfy the traditionalist and, more than anything, manages to tell Shakespeare’s convoluted tale with a lucid simplicity. The three acts each have a different sense of style and colour to match the moods of the three segments of the drama, taking us from the jealous rage of the first act to the redemption of the finale, via a brightly coloured and refreshing central act in which the love of Perdita and Florizel blossoms beneath the canopy of a huge tree. A Winter’s Tale is in repertory at the Royal Opera House Covent Garden until 8th May 2014 and all remaining performances are more or less sold out except for day tickets and returns.